John 00 Fleming to release 4th Volume of “Editions” and headline the first ever ASOT Progressive stage this Feburary! Lesser than 2 month into the new year and John 00 Fleming is already racing ahead in terms of his career. Earlier this month, he revealed the details about the 4th edition of his eminent “Editions” compilation series. The compilation with a four hour run time drifts through the wide spectrum of progressive, melodic and deeper trance sounds. The first three volumes of “Editions” hit the Beatport charts almost immediately after release and even made it to the #1 spot on Beatport’s All-genre album chart. Releasing mid-February, this much awaited compilation is sure to take listeners on a journey. John also knows how to release in style! 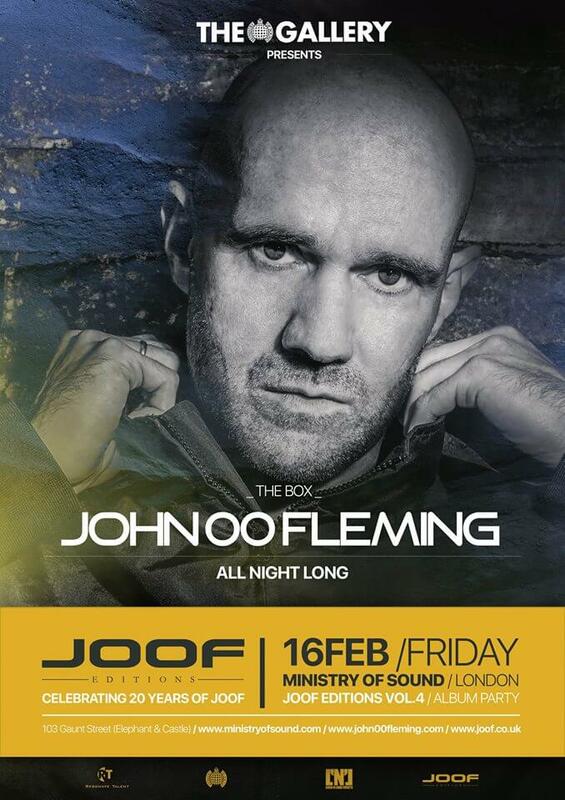 To give ‘Editions 4’ the reception it deserves, John has lined up a singular night of clubbing for Friday Feb 16th at London’s famed Ministry Of Sound. Long known for its fulsome weekly DJ line-ups, John will join the very-short-indeed honour roll of spinners offered an all-night-long set in The Box at The Gallery. It doesn’t end there for John! Straight after his spin at the Ministry of Sound, he makes his way to the Jaarbeurs in Utrecht to headline the first ever Progressive Stage at the 850 episode celebrations of A State of Trance! Taking place on the 17th of February, this is the first time in the history of ASOT that a progressive stage has been introduced. The concept was spearheaded by John himself and all it took was a phone call with Armin, who already has always been a fan of deeper and progressive sounds, to get the concept into play. The DJ Trancefamily that you don’t see. We see the hashtags of #trancefamily from passionate fans on social media, but what you don’t see is what happens in the background amongst the industry and our contribution in order to help the Trance scene grow, flourish and move forward, our version of an industry Trance family. I’m constantly hounding promoters, producers, DJ’s, the media etc to help get involved grow areas of the more specialist side of things where I fit, and it’s no different for my fellow colleagues whom support their styles and the results of this hard work is the wide musical spectrum within the Trance scene that we’re enjoying today. As I watch the biggest underground musical movement I’ve seen happening over in Progressive House and Techno, I’m also concerned that Trance is being reborn over there too and for some reason avoiding Trance. Though certain forms of Trance seem healthy today, the underground/progressive form is the gateway for the next generation, especially off the back of this huge underground movement thats appealing to the next generation, so its time to get to work to start building a bridge between these two worlds, after all history is repeating itself, and the wonderful heydays of Progressive Trance were born of an exact same movement in the 90’s. With sleeves rolled up and work to do, this is where we turn to our internal Trance family, so I reached out to a fellow DJ and friend I’ve known for years and someone that dearly cares for Trance, Armin van Buuren . Over an hour later and a lovely chat about all things Trance on the phone, we had forged a plan to introduce a stage dedicated to this sound at ASOT 850 A State Of Trance. This contribution will prove a huge investment for the future, as it’s the start of building that bridge and already others are following after hearing about this news. I wanted to put a human touch to this announcement to show and give a little insight, though we all maybe musically different, we have a united bond and friendship, all dedicated to the one genre we love, Trance. February looks absolutely brilliant for John with two massive projects falling in place! We can’t see what this year holds for him further!